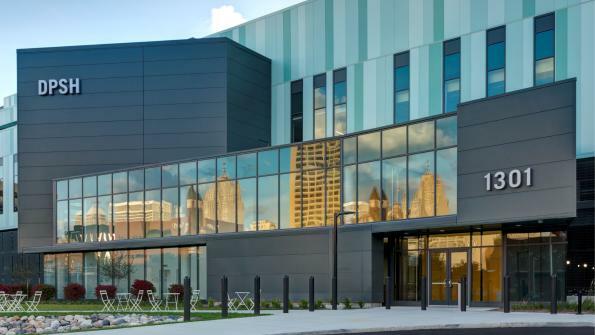 The renovated public safety department building in Detroit has nearly 90,000 square feet of insulated metal wall panels. Custom Valspar Fluropon coatings shield the panels and resist ultraviolet rays, dirt and stains. Detroit’s public safety department had been housed in an early 1900s building that one local news outlet described as “dingy” and “leaky.” Officials knew the existing facility was too outdated to make it practical for continued use, and they also hoped to project a fresher community image as the city continues work on its renewal. To meet that goal, the city purchased a newer facility and began planning to relocate the Public Safety Headquarters. First constructed as an office for the Internal Revenue Service, the new facility had more recently served as a temporary home for the MGM Casino. While the building had a more modern backbone than the existing headquarters, transforming it into a welcoming beacon for the community and efficient civic space still presented a challenge. To maximize efficiency and revamp the appearance of the building, architect SmithGroupJJR of Detroit worked with Metl-Span of Lewisville, Texas, to specify and install nearly 90,000 square feet of insulated metal wall panels. The architect introduced a color design from paint and coatings manufacturer Valspar to enhance the beauty of the panels. The design features a mosaic of intertwining blue-green shades. The large, vertical metal wall panels provide depth and movement between the variations in color. The vertical panels are balanced against the horizontal metal wall panels to pick up on the gray and beige tones of the building’s surrounding environment with a custom gray color. The structure also features five custom Valspar Fluropon coatings that resist ultraviolet rays, dirt and stains. The coatings are designed to retain their colors for the long term. The renovation project was completed in June 2013. The building now houses administrative staff for Detroit’s police and fire departments, the Michigan State Police Metropolitan Forensic Laboratory, the Building Authority office, the Homeland Security office and the Information Technology Services Group. In total, the facility can support up to 700 employees in its 400,000 square feet. The new headquarters has also achieved LEED certification, a testament to its efficient design and smart use of materials. Click here to learn more about Valspar.